content to your websites and apps. A Bucket is the main piece in the Cosmic JS content structure. It's very flexible and can power the content for an entire website or a portion of a website. Since your Bucket content is delivered via an API endpoint, your Bucket can also power content for any application including iOS, Android, tvOS, Apple Watch, IOT, AR/VR or any other way that you would like to distribute your content. An Object Type is any collection of Objects that share a similar function. Pages, articles, projects, etc. An Object can be a page, a blog post, or anything you want it to be. Cosmic JS gives you the freedom to create and manage content openly and create your own data structure. Each Object allows for the creation of a title, slug, content and Metafields. Metafields are very powerful pieces of custom data. 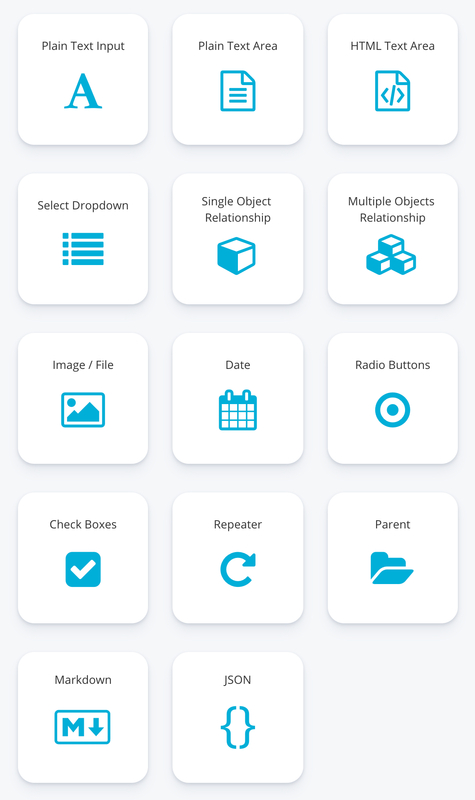 Current available Metafield types include: text, textarea, HTML textarea, select dropown, image / file upload, date, single Object relationship, multiple Object relationship, radio buttons, check boxes, markdown, parent with nested children, repeater, and JSON. Your created Metafields are transformed into key/values stored as Metadata in the API endpoints. Install the Cosmic JS NPM module to integrate content into any new or existing website or app. There are Node.js, React, Vue, Gatsby, Angular, and Serverless starter apps to help you get your project started quickly. Cosmic JS has client libraries to help you easily manage content on your website or app. Below are a few examples of how these client libraries can be used to add dynamic content to your app without much custom coding. Use the Cosmic CLI to communicate directly with your Cosmic JS account via the command line. Below are a few quick examples. Go to the Cosmic CLI NPM module page to see more examples. Download the Cosmic JS Python Client on GitHub. Add the cosmicjs.php file from the Official Cosmic JS PHP Client on GitHub to your app. Go to the documentation page to see more ways to add the power of Cosmic JS to your websites and applications.